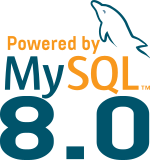 As for each previous version, to upgrade to MySQL 8.0 you must first read the upgrade section in the manual. It’s important to know that you should upgrade without skipping a major version, so upgrade from 5.6 to 8.0 is not supported neither recommended. Please also note that upgrades from any MySQL 8.0 RC won’t work. We support upgrade process only from GA versions. Then one of the most important section to be aware of, is the incompatibility changes brought with the new version. Once you have read the upgrade section in the manual and the release note of the version you want to install, with MySQL 8.0 and its new MySQL Shell, we developed an utility that will perform the checks to verify if your dataset and current configuration are compatible with the new MySQL 8.0.
dba        Enables you to administer InnoDB clusters using the AdminAPI. mysql      Used to work with classic MySQL sessions using SQL. mysqlx     Used to work with X Protocol sessions using the MySQL X DevAPI. shell      Gives access to general purpose functions and properties. sys        Gives access to system specific parameters. util       Global object that groups miscellaneous tools like upgrade checker. OK, as we can see we have a problem with one table still using utf8mb3, which might be common in 5.7. This is not a fatal error and the charset will be converted to utf8 automatically during the upgrade process. 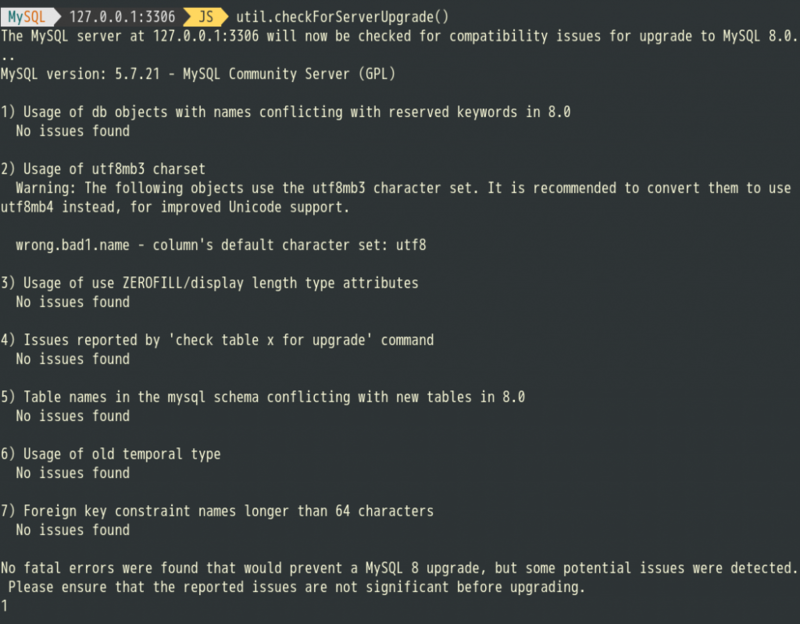 When you plan to upgrade to MySQL 8.0, please read the related sections in the manual, read the release notes and since 8.0.4RC, use the MySQL Shell to verify that your upgrade is possible. As written in the blog post, you need at least mysql-shell 8.0.x to have the util object.